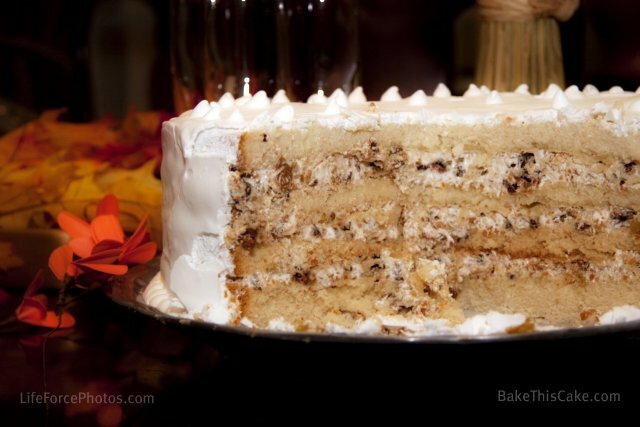 The Amazing Boiled Icing and Nutty Filling for the Lady Baltimore Cake | Bake This Cake! 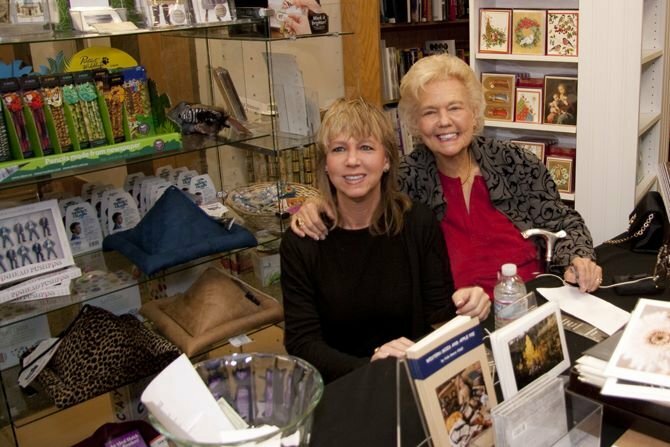 Presenting Boiled Icing – a classic cake frosting and throw-back to turn-of-the-century recipes …perfect for ringing in the new year vintage style! 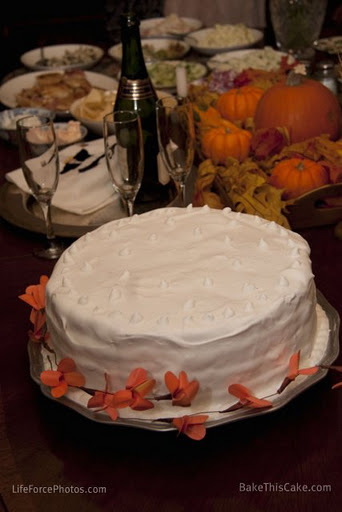 The filling for the Lady Baltimore Cake is decked with nuts and dried fruits all twirled together with the special Boiled Icing to re-create an unusual vintage surprise with each bite. The party season has not quite concluded. Yo! 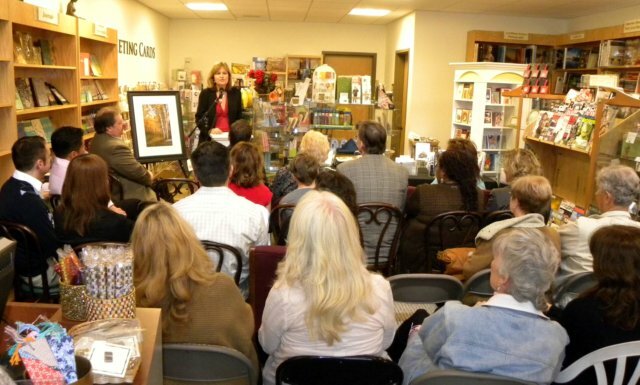 Resolutions are being mentally scripted by the boatloads. Mine? I have so many! I will try to think up better passwords. I will stop worrying about not exercising enough. 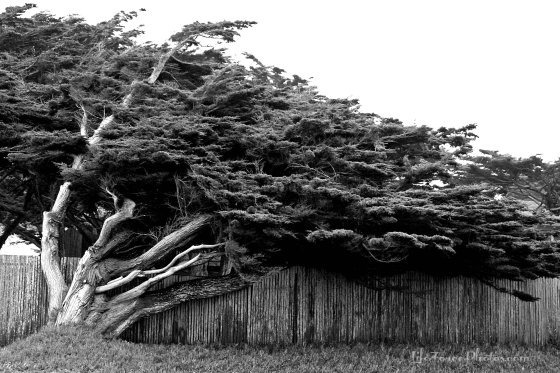 I will grow a thicker head of hair. I will embrace auto-correct. 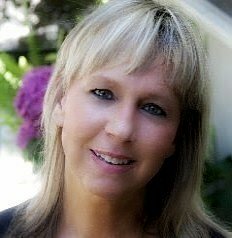 I will learn to talk like the GPS lady. And on and on! We are reflecting on the people, events and ideas that have impressed us over the past year of change. 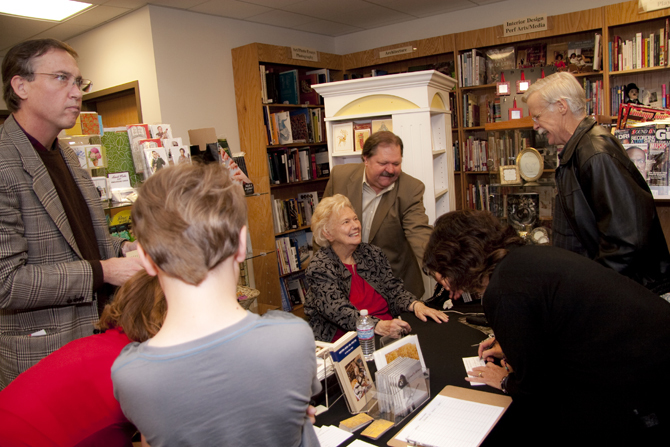 Questions about what the new year will bring are sneaking into our thoughts. 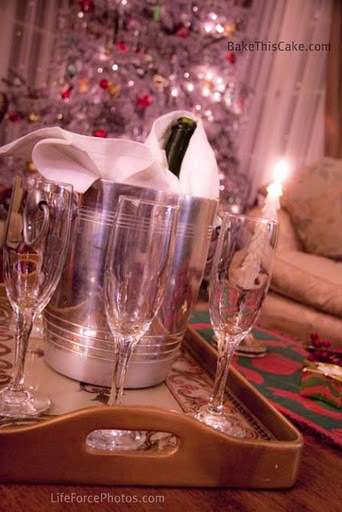 And hooking up with friends and family continues to play a a pivotal role in the season of holiday fellowship. Which brings me to — cake. You knew I was headed there, right? 🙂 Hip and cool vintage cake, that is. 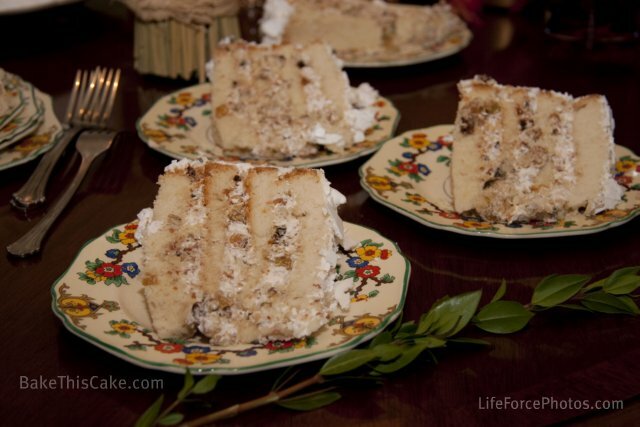 What better way to ring in the prospects of an amazing new year than with an historic cake from century-old recipes, tweaked to perfection for present-day tastes. 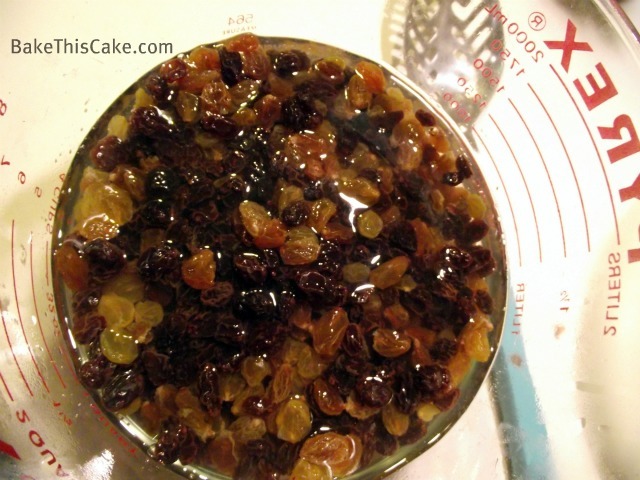 Drain the raisins in a sieve or strainer for about 1 hour. 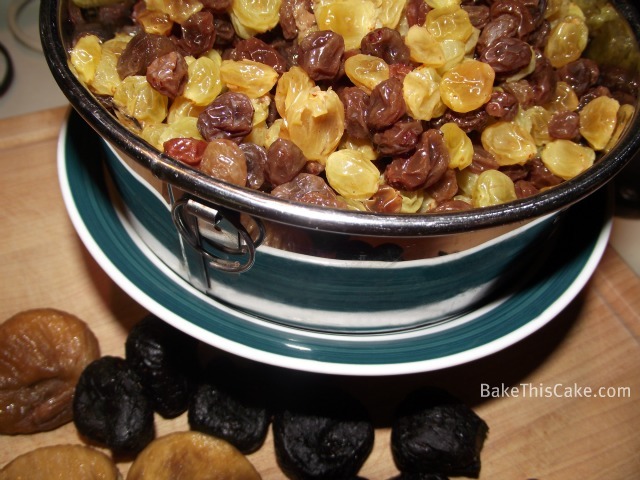 Pat the raisins dry with a few paper towels to make sure they are not soggy. 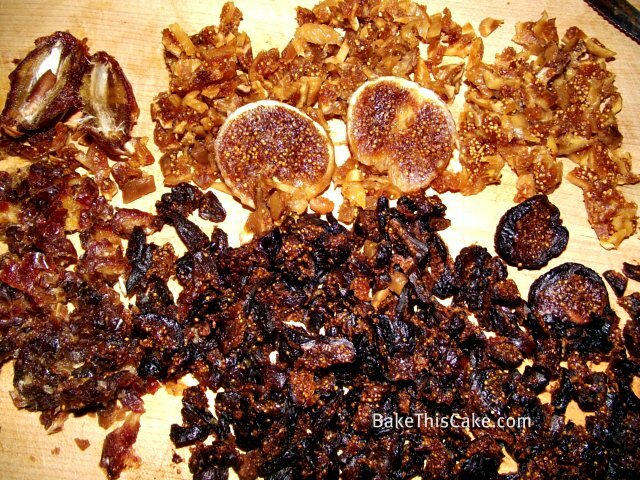 Tip: This combination of figs and dates should make about 2 cups of a finely sliced and chopped mixture. 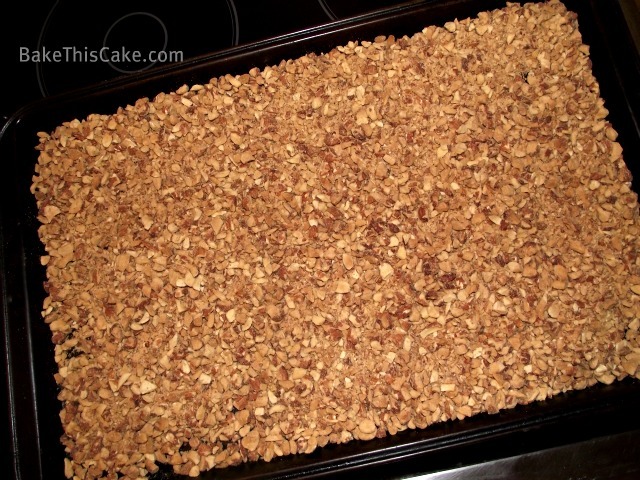 Now to the nuts…You may use walnuts or pecans for this recipe if you like. Now. 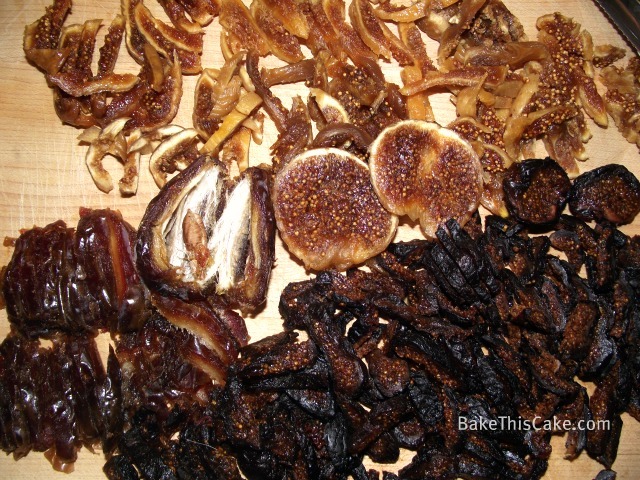 SMELL the aroma wafting through your kitchen! Amazing, isn’t it? 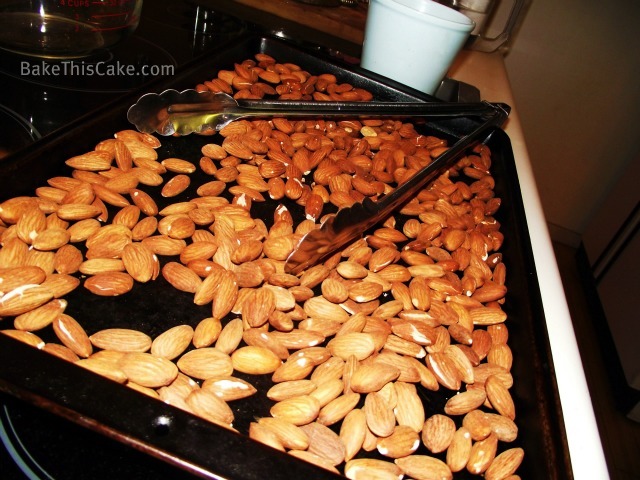 When the almonds are cooled, chop them into a small diced chop using the food processor — or chop by hand. Tip: Kick on my Pandora radio channel and listen to some classic rock if you’re chopping by hand and you’ll do fine. Just know, them’s a lot of nuts. Whew! The Boiled Icing is ready to prepare. Remember, from this bowl of nuts and fruits, feel free to take away as much as 2 cups of mixed fruit and nuts (to use for snacks or other purposes) if you think you will want a cake filling with less nut-fruit mixture. 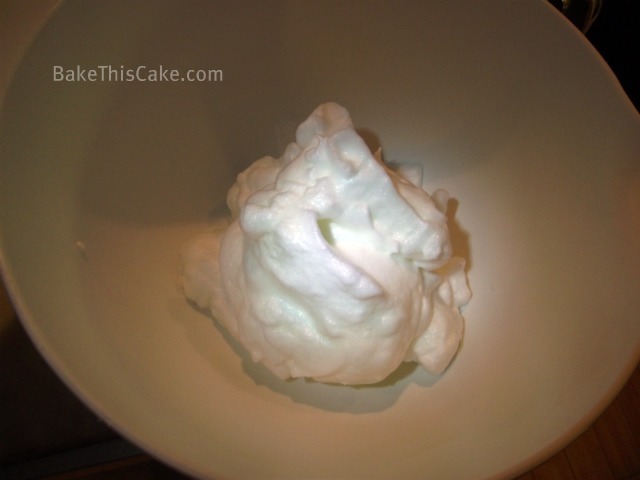 2-step Boiled Icing for Filling and Frosting: a fabulous, dreamy frosting that is purest white. We will separate some of the frosting ingredients so that you don’t have to work so fast to frost the outer cake before the frosting does it’s cool science trick and hardens. 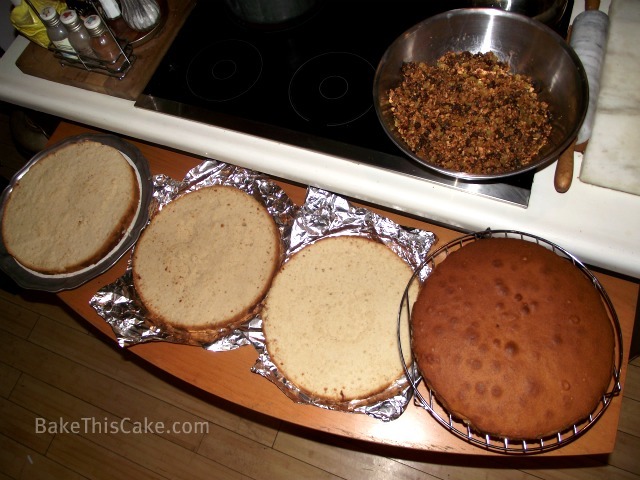 The bulk of the frosting will be prepared first to mix with the fruits and nuts for filling the inner cake layers. 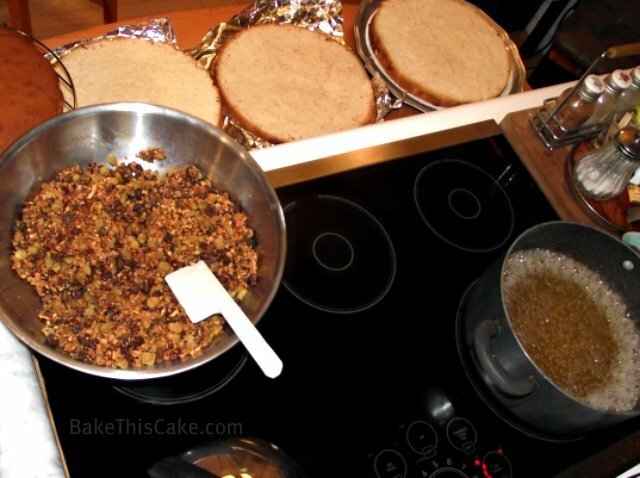 The top of the cake can be spread with this filling also, but that’s optional. Then we’ll work on the outer frosting. It’s a fun 2-step process resulting in a cake frosting that will transform before your eyes to harden into a soft white crust over the outer cake. 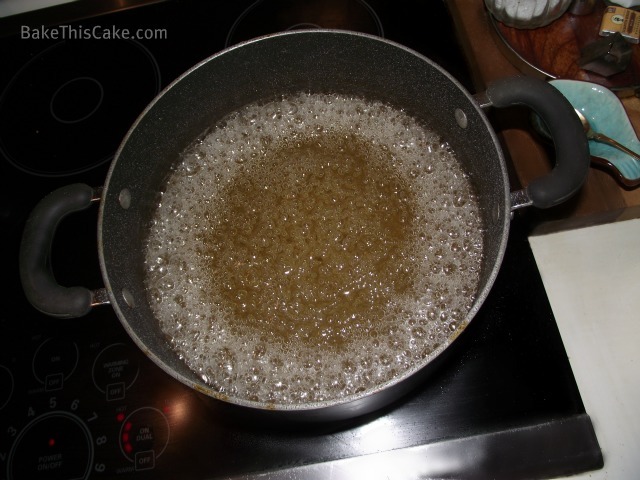 Boil the sugar-water mixture until the sugar “threads” or until the mixture reaches a heat point of 240 degrees (could take up to 30 minutes). This is where the strongly recommended thermometer comes in. 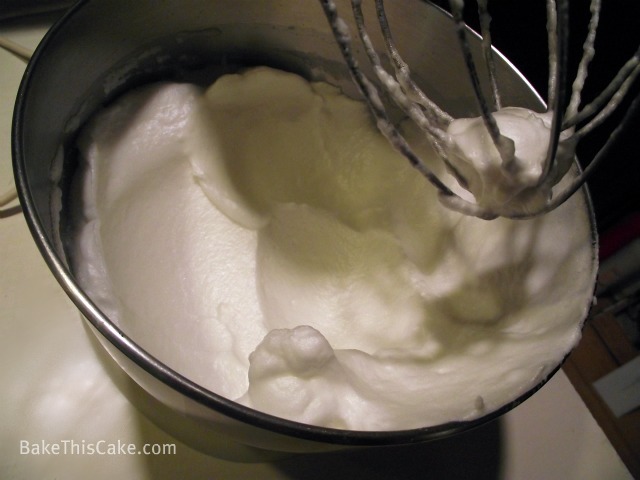 Since this mixture will be used to cook the egg whites for the icing, this mixture must reach a high heat point of 240 degrees in order to properly cook the egg whites for safety reasons (and to make this icing work the way we want it to). Separate 12 large eggs (egg yolks will not be used in this recipe). 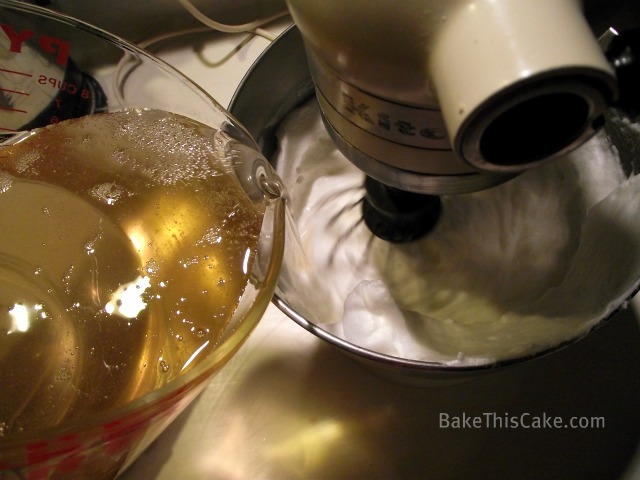 Set aside some egg whites: Remove and set aside 3 cups of the whipped egg whites (to use for the plain frosting for the sides and top of the cake). 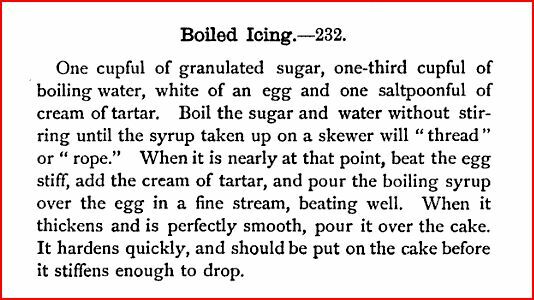 Set aside some sugar syrup: From the molten sugar-water pot, carefully pour into a holding container and set aside 1-1/2 cups of the very hot sugar syrup (to be re-heated for the plain frosting for the sides and top of the cake). Now back to our filling: Slowly drizzle the balance of the hot sugar syrup into egg whites while the mixer is on low-speed. 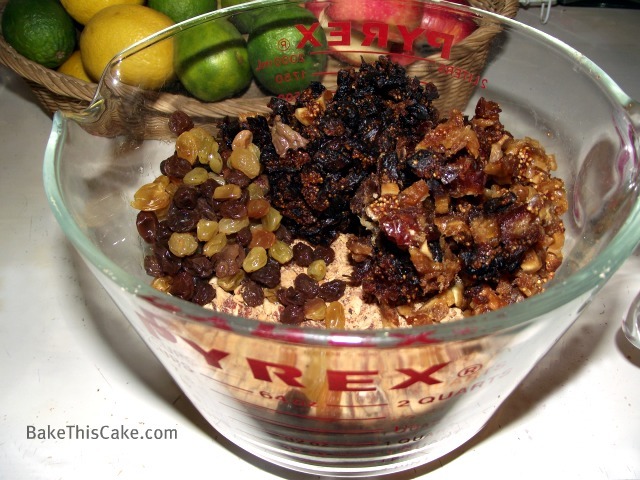 Decide if you want to use the entire bowl of mixed fruits and nuts for the cake filling. 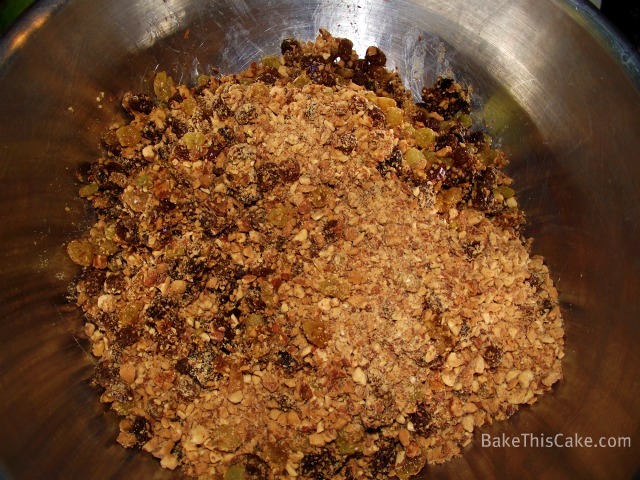 As discussed above, you may choose to remove as much as 2 cups of fruit-nut mix and the cake filling will still be nutty and fruity. Decide if you want to use fruits and nuts on the top of the cake or leave the top smooth. 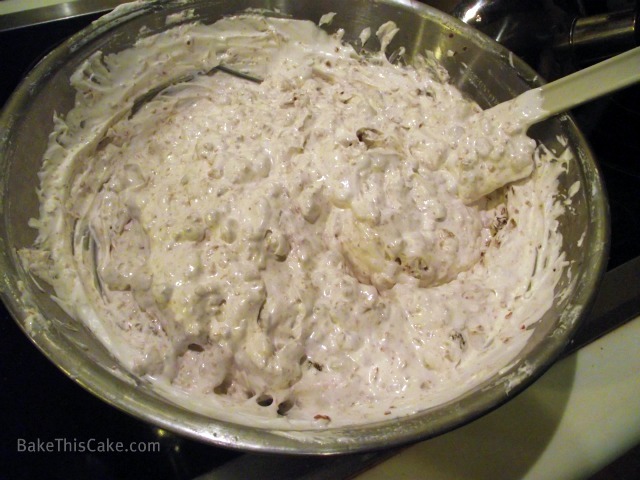 Mix the prepared Boiled Icing in with the prepared fruit-nut mix. 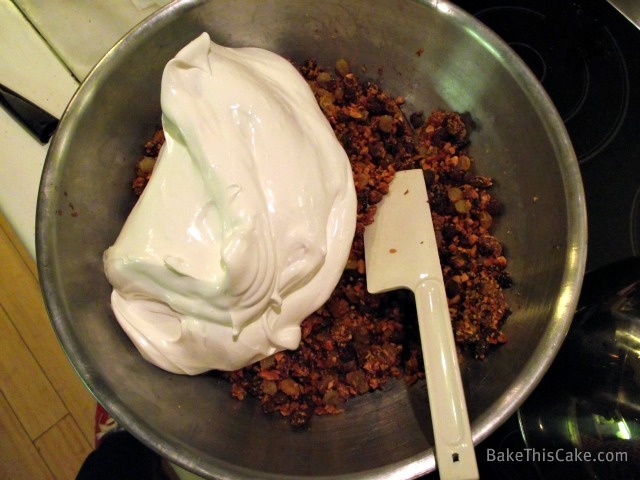 Fold nuts and fruit thoroughly into frosting. 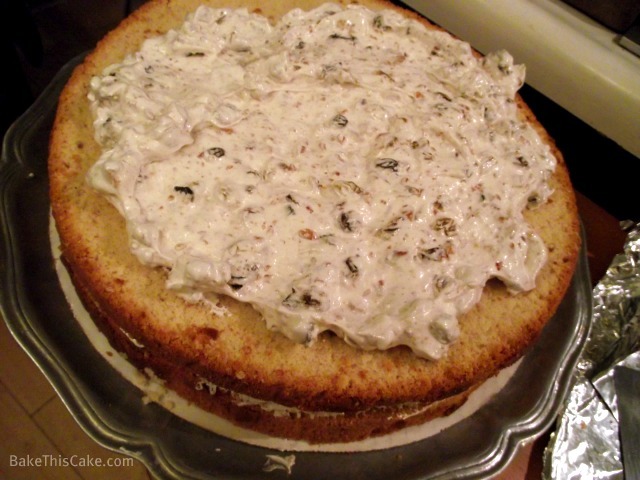 The top of the cake can be left pristine or dolloped with the nutty frosting (or covered the plain mixed nuts mixture without frosting)…your choice. All will soon be swallowed in pure white icing. Re-heat the reserved 1-1/2 cups of sugar-water syrup to 240 degrees and drizzle it slowly into the reserved 3 cups of egg whites, beating to a heavenly and glossy finish. 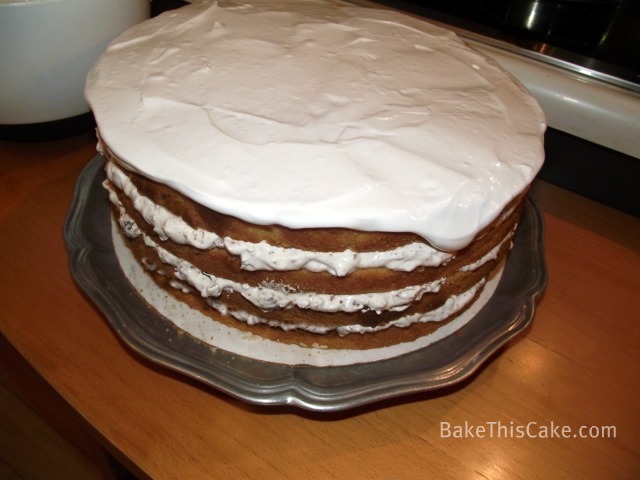 Using a spatula or other frosting tool, spread the prepared Boiled Icing over the top of the filled cake, adding extra Boiled Icing at the top sides to let it run over the edges, smoothing it down and across the sides of the cake and decorating the cake in your preferred fashion. 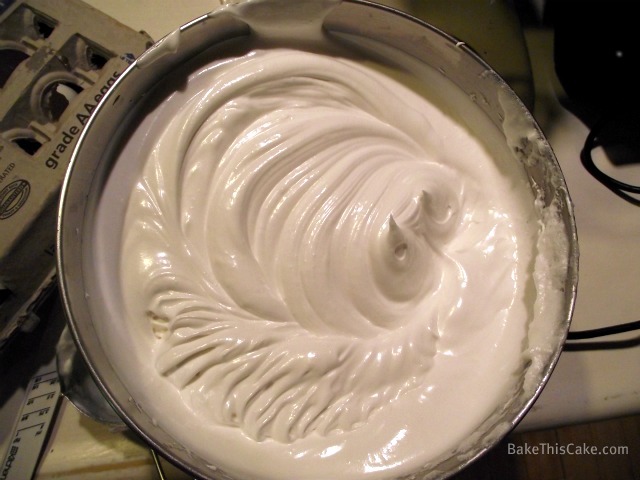 You may create swirls or dots or make it completely smooth using a flat tool or spatula. 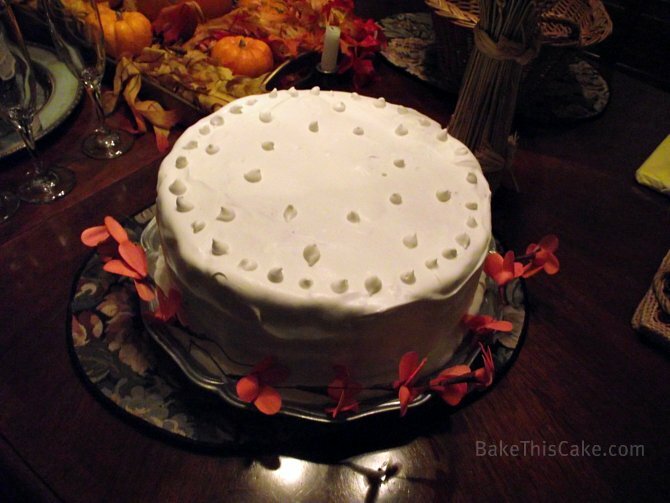 Because this sticky Boiled Icing will harden soon, be sure to wipe away any drips while the frosting is still wet. I used a few wet paper towels to clean away my messy drips. It may take a good hour before the cake is fully hardened. 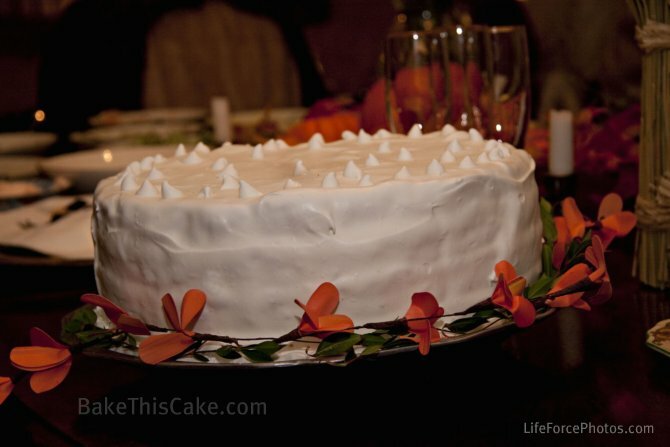 Store the cake in a large cake container without letting anything touch the frosting at any point before serving. 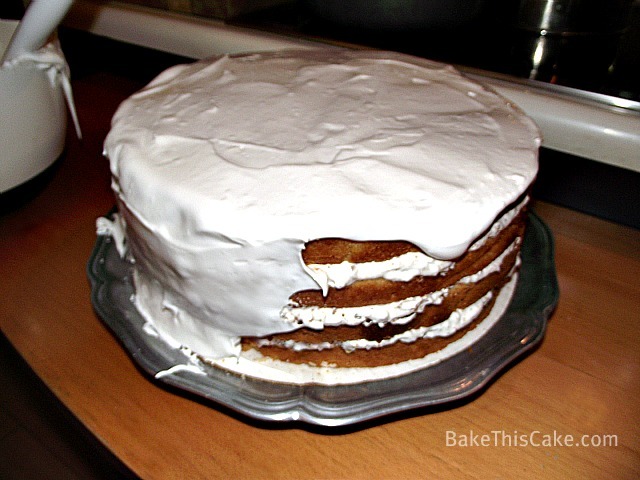 Initially, the frosting could become “dented”. 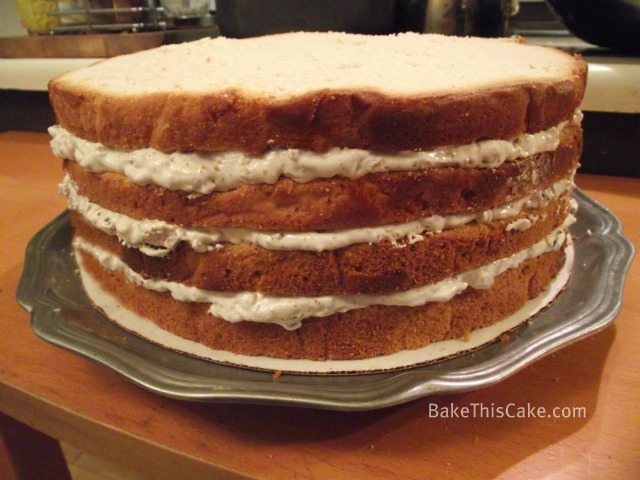 After it dries, the frosting could become “chipped”. 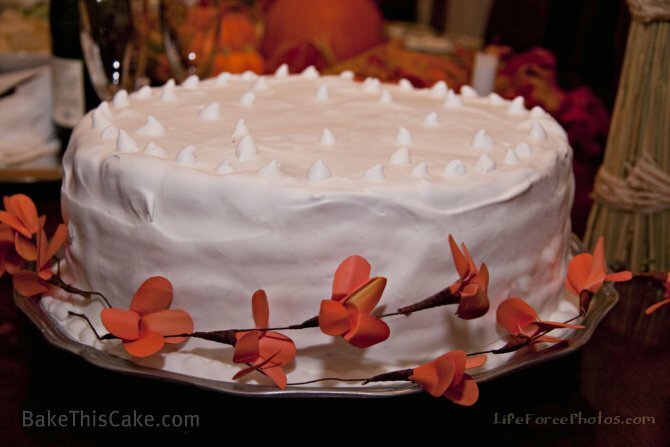 Overall, this is a nice cake for traveling and I would say it travels well on a large sturdy cake plate, covered or uncovered. Here’s to your vintage celebration cake! 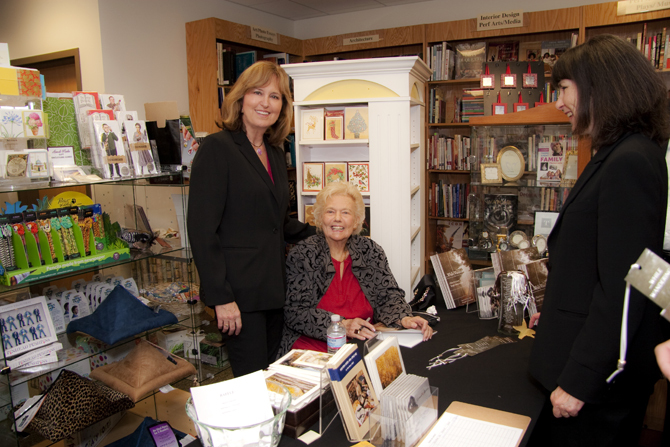 Happy New Year’s to you all and be sure to join us on Facebook, on Twitter and now on Pinterest! Marco Polo Profiterole Tower by Bake This Cake! Wild Blackberry Charlotte by Bake This Cake! Princess Kate Chocolate Mocha Cake by Bake This Cake!